At the crossroads of the long-range optics industry are the rare products called Rangefinder Binoculars. While still available to the general public, the rarity comes at an increased price. 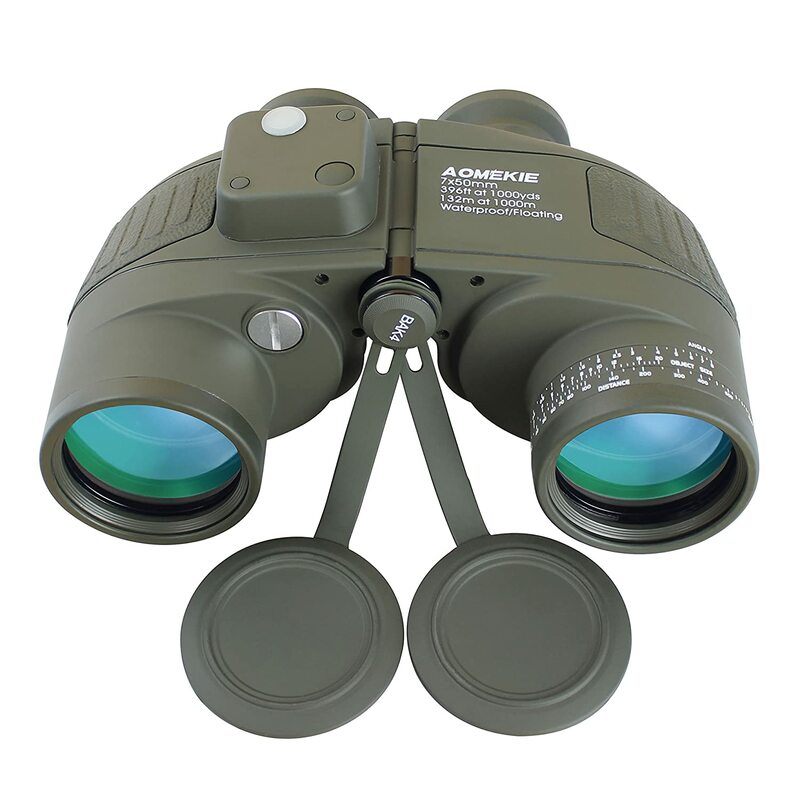 Basically, these optics combine the basic mechanics of binoculars with the acquisition abilities of rangefinders. As with normal rangefinders, these types of binos do require batteries. They may not be the large CR2 batteries that most rangefinders run on but you will still have to spend some money every now and then to replace them. The process to hybridize rangefinders and binoculars is very tricky, hence the larger than normal price jumps. These binoculars are fine-tuned during manufacturing to make sure that the rangefinding system is accurate and compatible with each size of objective lenses. Laser rangefinders usually don’t use the x and y-axis markers that appear within the lenses. They use a laser acquisition system and a pointer reticle that simply tells you how far away each object is. Are you considering Rangefinder Binos? 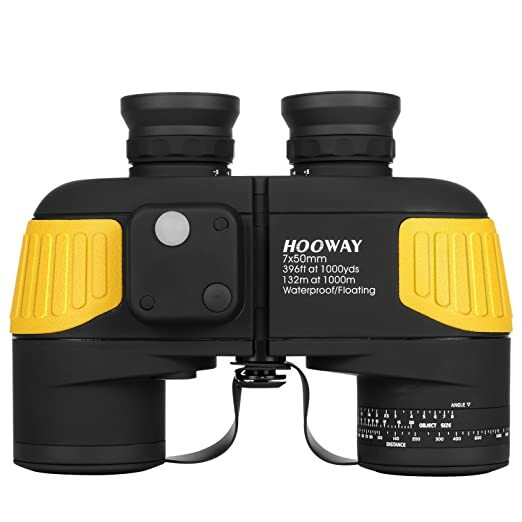 The Hooway 7x50mm model is sort of your all-around tough and reliable set of rangefinder binos. The large, 50mm objective lenses are encased in non-slip rubber armor-making them shock-proof and water-proof. On the underside of the binos is a tripod adapter. A tripod may be ideal in situations where you are planning to remain in one spot for a long time. If you can approximate object height or width, you’ll get the object distance. Aside from the rangefinder itself, the binos are equipped with an internal compass for navigation and direction. We like that the Hooway’s objective lenses provide a wide FOV and appropriate level of zoom all for a very affordable price. The rangefinder may not be the best in the world, but it gets the job done and saves you the hassle of having to carry two different pairs of optics. Aomekie’s set of 7x50mm binos are very similar to the Hooway model. They are a durable pair built to handle tough conditions whether it be rain, fog, or humidity. 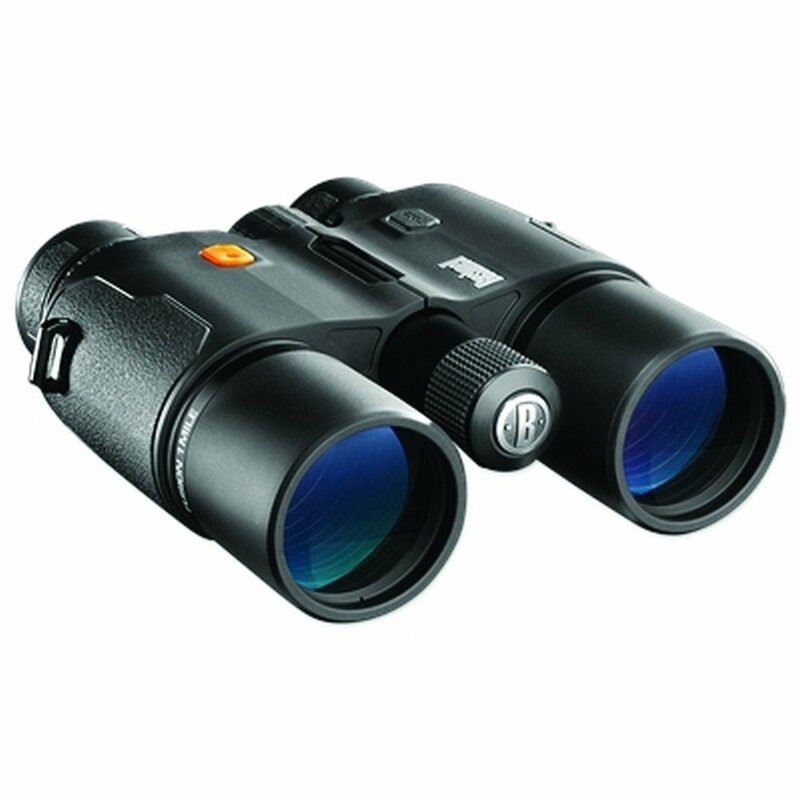 The rangefinder with these binos is nearly identical to the Hooway and the same goes for the compass. The downside is that you won’t get the exact distance of an object to the “T” but it will be very close. The tricky part is knowing or guestimating an object’s height or width. 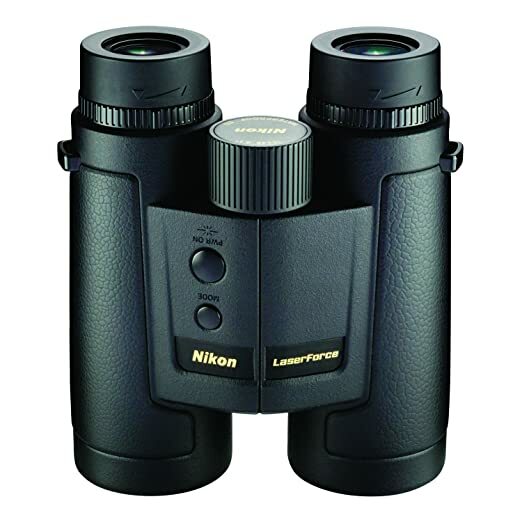 One thing to note is that the product description is misleading-these binos do not come with night vision but do better in low-light conditions than the average pair. Aomekie has a couple of different colors available, but make sure that you remain on the 7x50mm pair. The 10x50mm by USCAMEL increases the zoom by a factor of three. This gives it a little bit of an advantage over the Aomekie and Hooway models in terms of close up detail and target acquisition. The more chance of appropriately identifying the target, the more exact your rangefinder calculation is going to be. We like that these pair of 10x50mm uses folding eyecups. This design makes viewing for users with glasses much easier. Especially when conditions aren’t great, this pair of 10x50mm is durable and reliable for users of all ages and experience levels. The FOV at 1000 yards with these binos is 396 feet, which is about the same as the Aomekie and Hooway models. 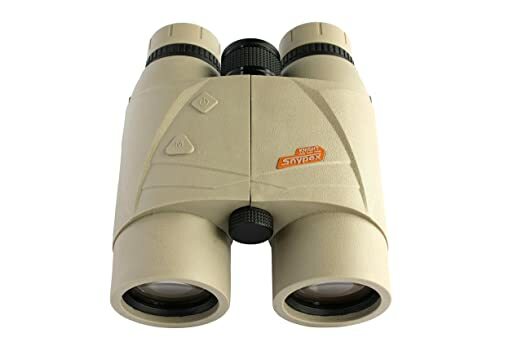 The level of zoom on this pair of binos will be key in identifying objects and animals on the water, where vision can be blurry and unfocused. 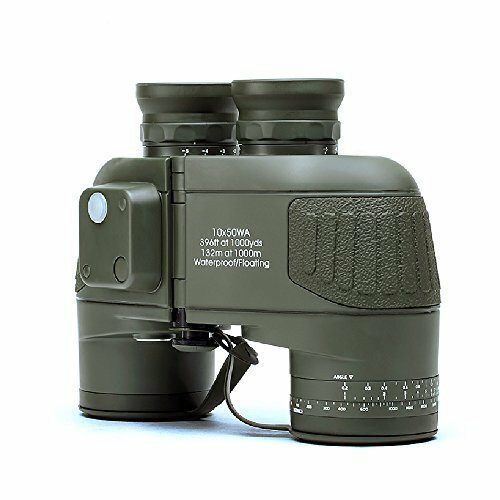 The Snypex Knight is an 8x42mm model of binoculars with a laser range finder. This simplifies the overall process with the push of a button. Speaking of which, the buttons are conveniently located across the top of the binos-one for power acquisition and one for changing the distance measurement. With a hard rubber exterior, the Knight is built to handle tough conditions and the occasional high drop. A common laser rangefinder problem is inaccuracies when the laser is pointed at or through glass. You can rest assured that the Knight has solved this problem and even allows for continuous ranging with moving targets. The inclusion of the rangefinder and its batteries barely alters the overall weight of the Knight. In the end, it’s still covered protective armor, so you almost wouldn’t notice the difference until you actually used them. 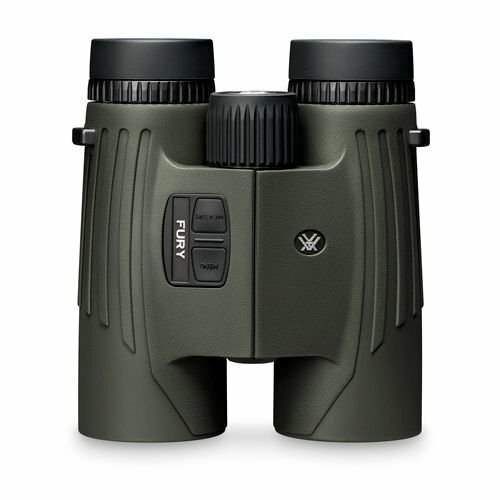 The Bushnell Fusion 10x42mm pair of binos give a good introduction to higher-end rangefinder binos. Its powerful laser extends in a one-mile arc in front of the binos. The internal display is actually pretty intuitive. Not only will the Fusion give you the distance to the target, you can switch between rifle or bow hunting focus and get the angle of elevation. For the hunter or outdoor enthusiast who is nitpicky with detail, these measurements are hard to pass up. At maximum range, the rangefinder can acquire targets up to 1760 yards away. In particular with the rifle mode, the Fusion has different settings that allow you to sight-in the binos at 100, 200, 300, and 400 yards. While people may initially be wary of picking up a pair of rangefinder binos, Bushnell really sets the tone for the industry by including multiple ways get the correct distance. It does this, all while providing the user with great light transmission through the lenses. Nikon’s 10x42mm laser force binoculars are a sight to behold. 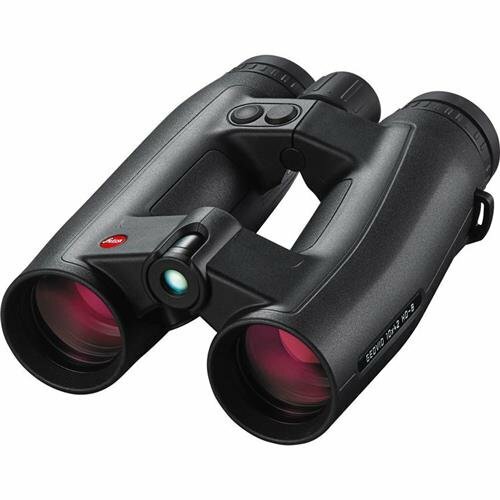 Most rangefinder binos of this price range and above use lasers to get the distance to an object. They are more accurate than the cheaper pairs of binos that require you to do some slight calculations to get the approximate distance. The laser force has a range of 1900 yards and can also factor in inclines and declines. This small but noticeable addition to the laser rangefinder will ensure that you are getting near precise measurements. In low light conditions, you can also adjust the intensity of the display within the lenses. Like most rangefinders, the laser force can acquire the range of a target as it moves, but only up to 8 seconds. Overall, the laser force is one of the best all-around rangefinder binos despite the price. We all know how popular Vortex can be and they really knock the ball out of the park with the Fury’s. Their 10x42mm measurements give you ideal FOV at 1000 yards and provide ample light transmission so you can study an object or animal closely. The Fury’s rangefinder reticle is similar to the one you’ll find in a normal rangefinder. Like the Laser Force and Fusion, these binos utilize a laser to acquire distance. If your target is at an odd angle away from you, the Fury employs the Horizontal Component Distance (HCD) to compensate for those angles and ensure you are getting precise distances. Aside from being a reliable pair, they are waterproof, fog proof, and built to withstand the occasional drop or scratch. The 10x42mm Leica Geovid’s look like some oddly designed optics, but don’t let that fool you into thinking they’re a lackluster pair of binos. The orientation of the binos has no effect on your overall viewing experience, it’s just how the lenses are constructed. While the Geovid indeed uses a laser to calculate distance, it also factors in ballistic trajectory. For example, the actual distance to an object might differ with a bullet as opposed to a laser. If you were holding a gun instead of the Geovid, the binos will factor in a bullet’s drop to give you perhaps the most accurate information on our list up to 1200 yards. What makes the Geovid worth the price? It’s quality optics. The Geovid’s wide FOV at 10x42mm makes it nearly unmatched in wide area scanning and target acquisition. The ability to combine a lot of perks like detail and zoom in addition to a rangefinder is what gives the Geovid an advantage over its competitors. The price doesn’t get much larger and the quality not any better than the Carl Zeiss Victory 10x56mm models. Despite their price, they’re more than capable of handling rain and fog. They’re encased in thick but grip-friendly rubber to protect against scratches. So what makes the Victory’s the cream of the crop? They do sport the largest objective lenses on our list with about the same level of zoom. You’re going to notice a difference in zoom quality between the Victory’s and a pair of 10x42mm’s. 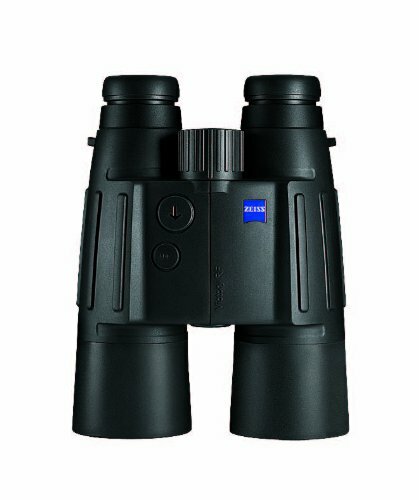 Zeiss ensures that with this pair of binos, in particular, you’re getting unparalleled quality through carefully coated lenses. The rangefinder on this set of binos is a simple but incredibly accurate laser that can acquire targets up to 1300 yards away. Another factor you’ll appreciate is the Victory’s performance during twilight and evening. With enhanced optics and larger lenses, the Victory is going to be soaking up more light compared to any other pair of binos on our list. With the appropriate light transmission and zoom, you’ll still be able to see in detail in low light. One thing is for sure, Rangefinder Binos definitely cut down on the space and weight given by carrying two items at once, even if it is minuscule. Despite the couple thousand dollar difference between the cheapest and most expensive pair, each of these binos has proven its worth in the field and picked up some satisfied customers along the way. Personally, we like the laser-equipped rangefinder binos, but the ones that you use an old-fashioned x and y-axis do a throwback to the old ways of calculating distance. We imagine that the laser-equipped binos are going to more suitable for hunting and other tracking activities, while the others will be suitable for sight-seeing and birding.